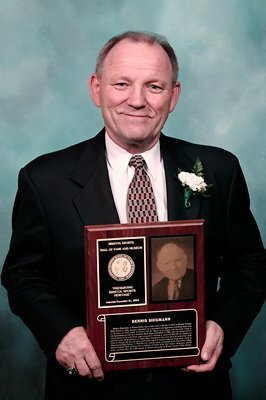 Dennis Siegmann, a Pennsylvania native who came to Bristol to teach at Bristol Central High School in 1972, earned a reputation as a successful and aggressive wrestling coach who in 23 years as head coach at Central led the Rams to 11 league and two state Class L championships as well as a mythical State Open Championship in 1985 when his squad had an unprecedented six individual state champions. Posting a record of 348-109-12, Siegmann coached three All American, 11 State Open champions and more than 20 individual state Class L champs. I just finished my first season returning to wrestling coaching and also teaching (semester two still going until May) at Labette Community College as an assistant coach and an adjunct geography teacher. We just finished winning the NJCAA National Junior College Wrestling Championships in Rochester, MN. There are 10 weight classes in college and we had nine All-Americans with 2 Champs; 2 seconds; two thirds; and three fifths. All I can say is WOW, what a ride. I have enjoyed this experience (coaching and college teaching far beyond what I expected). We set a Junior College record for the most points scored in a National Championship. At 65 years old, “I can’t believe I am still living my dream”. Many thanks to all who have helped me along the way. Retirement – What is that?